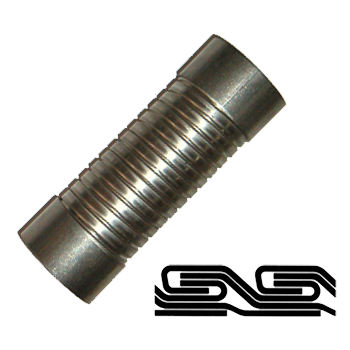 SL is made by helically winding two pre-formed strips of metal into a double interlock hose. Through a unique manufacturing process the inner liner becomes an integral part of the hose. It covers the interlock joints to form a relatively smooth inner bore. For applications involving large volume transfer of dry bulk materials, the initially higher cost of interlocked hose with an integral strip liner is far outweighed by the advantages it offers over those of other hoses, whether these be of metal, rubber or like materials. The high flow rates for lined interlocked hoses are well known resulting in reduced vehicle turnaround times. Additional advantages are reduced air losses from its tighter construction, elimination of materials degradation and contamination experienced with other hoses, plus a longer service life due to greater abrasion resistance. Ideal for hard to fluidise materials in industrial plants, ships, barges, silos, elevators, trucks and rail units. Uses include pneumatic transfer of bulk materials in powder, pellet, granules, flake or pebble form such as chemicals, feed, flour, grain, plastics, sugar, cement, pebble, lime and sintered iron ore. Manufactured to the specifications where applicable of ISO 15465 Type DOU. Incorporated in 1957, RADCOFLEX has a long history of supplying flexible piping solutions to a wide variety of industries including the automotive, power generation, materials handling, refrigeration, refineries, petrochemical, telecommunications, smelting, mining, marine, defence, ventilation, road making, oil, gas and chemical industries. Associated CompaniesRADCOFLEX Australia Pty Limited founded in 1957 is the original RADCOFLEX company. Neither RADCOFLEX Australia Pty Limited nor its subsidiary RADCOFLEX Singapore Pte Ltd is related or affiliated with Radcoflex India Pvt Limited. RADCOFLEX Australia has not authorised the use of its Registered Trade Mark or specific product names by Radcoflex India. All Contents © RADCOFLEX Australia Pty Ltd. All Rights Reserved.